With rock ‘n’ roll music playing lightly in the background and Dr. Jan singing or playing air guitar on occasion, Teitelbaum Chiropractic is not your typical doctor’s office. Our patients like it that way! At our cheerful and casual practice, we enjoy engaging our patients like friends. Sonia, the highly engaging office manager, brightens the day of every patient. Before your appointment, you can download the new patient paperwork here, or we can email it to you. We encourage you to complete the forms before your appointment to save time. Dr. Jan will meet with you to determine what brought you in and will let you know if he thinks he can help you. He will want to knows much as he can about your problem and how it has affected your life. The following tests will be given as part of his evaluation process: neurological, postural, range of motion, and a chiropractic spinal analysis. He’ll present his findings to you and let you know what specifically will be required to help you. You will then decide if you would like to proceed with care. Please allow up to an hour for the visit though it typically doesn’t take that long. Once you’re out of pain, you may choose to continue with the benefits of wellness care. Just like you get routine oil changes for your car to keep it running well or see the dentist for regular checkups to maintain excellent oral health, regular chiropractic adjustments can help you stay healthy and young! Dr. Jan will always ensure that you are responding to his care and provide the options for your next step, given your goals and your findings. 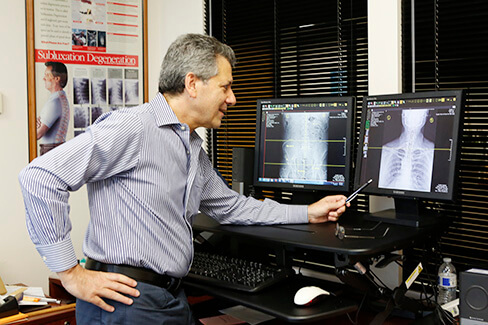 In addition to providing his patients with chiropractic care, Dr. Jan will educate his patients about subjects such as workplace ergonomics, how to get to sleep, exercise, nutrition, and other health-related topics. He will also provide home care instructions as well as specific exercises, depending on your distortion patterns. We look forward to getting you on the path to better health and wellness. Contact our Mission Viejo practice today to book a same-day appointment!